This is not this first cake I’ve made from Nigella’s Chocolate Hall of Fame (from ‘Feast’). Both the chocolate orange cake and the chocolate guinness cake have a special place in my heart. I even tried out the chocolate orange cake as gluten free cupcakes, with some success. So when I needed to make another birthday cake, it was an obvious place to start looking. 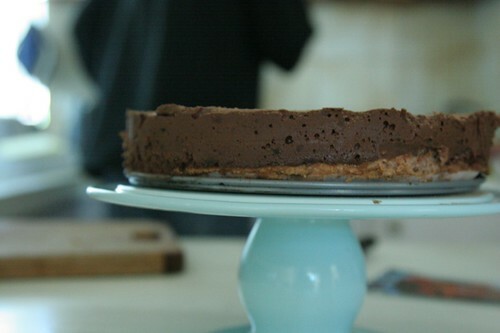 The chocolate truffle cake appealed because it required minimal baking and, well, chocolate? cream? rum? What’s not to like? My love for bite-sized tea sandwiches is relatively new. It’s only probably only in the last year that I’ve understood how lovely a cucumber sandwich can be. So an invitation to morning tea was the perfect opportunity to re-visit a couple of sandwich recipes, which I became acquainted with earlier in the year. First off we have cucumber sandwiches. 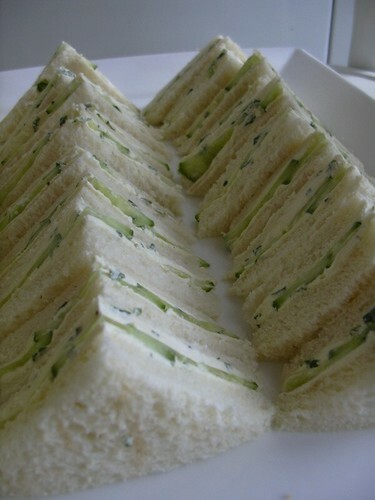 Or, more precisely cucumber, cream cheese and mint sandwiches. I first had something like this at Leaf Tea Merchants in Mount Lawley, as part of their Parisian Tea (v. nice, btw) and the mint in particular won me over. These sandwiches are very easy to make: mix together half a tub of philadelphia cream cheese (~125g), a couple of dessertspoon fulls of chopped fresh mint, a squirt of lemon and some cracked black pepper, and you should have enough spread for 10 slices of white bread (i.e. 5 sandwiches , or 20 sandwich triangles). 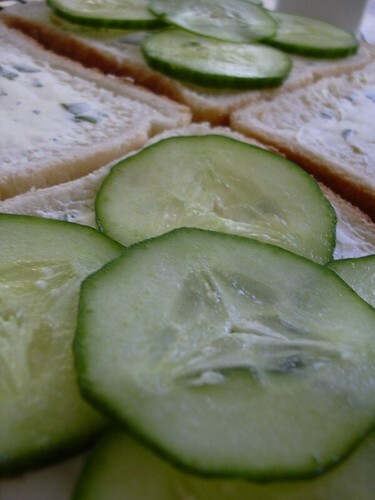 Lay some thinly sliced seedless cucumber between 2 slices of bread, remove the crusts, and cut as desired. Macadamia oil – just a drizzle. (Nigella’s original recipe calls for groundnut oil and sesame and I would have used sesame in preference, if I’d had it to hand). Cream cheese – to ‘butter’ the bread – mostly because I thought the chicken mixture might make the bread soggy without a bit of a water resistent layer. I was probably right (pretty sure butter would have been fine here too). The chicken mix was simply the mango, chili, lime, coriander and chicken all relatively finely chopped and mixed, with a desh of groundnut oil over it at the end. I had some concern that this mix wouldn’t hold together and I had a backup plan of adding mayo as a binder, but it was absolutely fine. I was planning to make little triangle sandwiches here too, but at the last minute, I made finger sandwiches using three slices of bread (white, wholemeal, white) for variety (inspired by this recipe on Taste.com.au). Construction was a bit more complicated than for triangles, but still relatively simple. 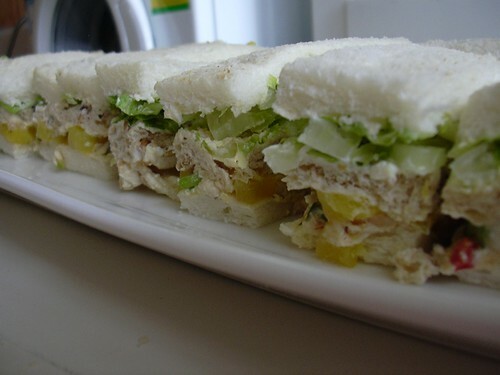 Spread cream cheese on a white bread slice and layer the chicken mix on fairly thickly (maybe 5 mm thick). Spread cream cheese on both sides of the brown bread and put on top, then layer on shredded lettuce and a final slice of white bread (again, with cream cheese). Cut the crusts, then cut each square into thirds. I made 4 whole sandwiches (or 12 fingers), but had enough chicken mix for another 2 if I’d needed. Which was great cos I had no backup plan!